Australian author Paul Howarth’s debut novel is a blood soaked, confronting exploration of the Australian frontier of the late nineteenth century. Not for the faint of heart, this coming of age story is reminiscent of the works of modern American western writers like Cormac McCarthy. When the book opens it is 1885, Billy and Tommy are sixteen and fourteen year-olds living on their family property in the drought affected wilds of central Queensland, in North-Eastern Australia. Their father is just managing to eke out a subsistence living on a slowly dying property while also feuding with his much more powerful neighbour John Sullivan. The boys’ world is thrown into disarray when they come home from a day out to find their mother and father dead and their younger sister shot. They ride to the neighbouring Sullivan property where they are quickly convinced that the culprits are members of the local Aboriginal tribe, the Kurrong. Sullivan has been steadily trying to wipe the Kurrong out and uses the boys to bring in the sadistic head of the Native Police, Noone. The two, fuelled by thoughts of revenge, are allowed to ride out with Sullivan, Noone and his posse of Aboriginal trackers to find the people responsible. But before long, Tommy realises that what they are doing has very little to do with justice. Howarth does a good job of drawing Tommy – his naiveté and his confusion as the mission he is on spins out of control in ways that, as a fifteen-year-old, he cannot prevent. Tommy is constantly having to reevaluate himself and what he believes in while being groomed by the men around him to become a killer. He watches helplessly as Billy falls under their spell and lines himself up with a man who Tommy is sure is up to no good. Only Killers and Thieves is violent and confronting, moreso knowing that it is based on historical events. Howarth does not shy away from the things that humans will do when they have decided that another group of people are less than human and therefore not worthy of any human rights or decency. The treatment of the Aboriginal people that the group encounter on their travels is shocking and often hard to stomach. And in an age where revisionists are trying to ignore this element of Australian history, to be reminded of it in such a stark and unvarnished way is important even while it is difficult to read. The twist in this tale is obvious from fairly early on and Howarth does not hide it. But its obviousness to the reader is not the point. Howarth is looking at the journey that Tommy takes, his willingness to believe a certain narrative, the way his experiences shape not only his search for the truth but also his response to those revelations. Tommy eventually comes to realise that when he is told that the local Aboriginal people are “killers and thieves” that this epithet works much more succinctly to the white people that he has dealt with. 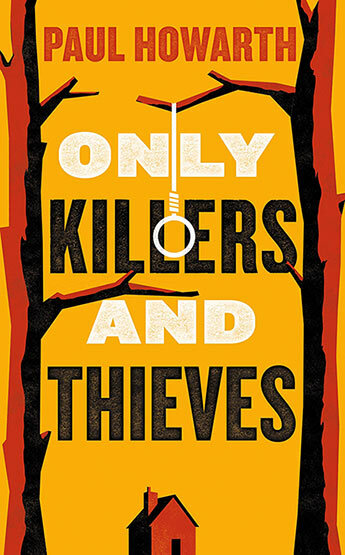 Only Killers and Thieves is an accomplished debut. Howarth manages to shine a stark light on a disturbing and often ignored aspect of Australian history – the systematic ‘dispersal’ of Aboriginal people to allow for the spread of agriculture. He does this through a series of well drawn if archetypal characters and with a sympathetic central character who ends up growing up in all the wrong ways.